Quiet progress, global awareness and bright young things. LM1 may have had a lower profile in 2016 but the team is still active and committed to progressing what is a complex pioneering lunar mission initiated by the private sector. Keep the faith! So firstly, why have we been relatively quiet? And why have we not been publicly fundraising? Well, following our 2014 Kickstarter crowdfunding which successfully raised enough money to fund our six month Preparation Stage, we were able to finally start work in earnest. But just as our new campaign was being launched, the UK tax authority informed us of its different view over a technical issue concerning VAT – the UK’s sales transaction tax. We maintain that our crowdfunding was capital funding (based on investment with tax on deferred performance), but the authority claims it was revenue funding (based on direct sales with tax immediately due). We’d had a lawyer on the team and we’d also taken advice from a tax specialist, but it appears that the rules regarding early crowdfunding for long term projects are simply not clear for this new area. After over a year of to-ing and fro-ing, we decided to take the case to a judicial Tribunal to rule on the matter. We believe it will be a test case that would lead to a change in tax treatment for crowdfunding – anywhere. So the tax authority's withholding of cash meant that we prematurely ran out of funding in October 2015. Since then we have concentrated on voluntary activity to make some progress. Enough of what’s been holding us back, what about that progress? And thankfully plenty of things have been advanced with the encouraging voluntary support we continue to receive! Firstly, we’ve been in discussion with a non-UK sponsor to recover the funding momentum of the project. That discussion is ongoing, but if successful it will provide us with new cash and arrangements for proceeding to the next stage – all under the leadership of the non-profit Lunar Missions Trust. Meanwhile, during the year we signed up a fantastic 67 pilot schools from 32 countries around the world, and the pilot education programme is underway. Activities so far have included three dozen high school students each undertaking a bespoke and mentored one month full-time project during their summer vacation, and a schools poetry competition for all ages during World Space Week. It’s all part of developing and testing LM1’s educational potential. If you know of a school that would like to join our pilot programme, please get in touch here! We’ve also expanded our network of volunteer Chapters, which co-ordinate LM1 activities, websites, meetings etc in 29 countries around the world. 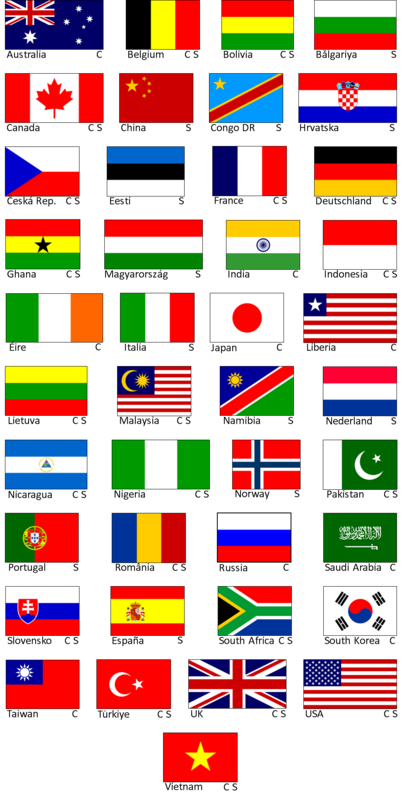 Together, our schools and Chapters represent 41 countries – see the flags below. Conditional on sponsorship, we plan to update our website. We have a new online collaboration platform ready-to-go to replace the existing Lunar Missions Labs and it will be available initially to pilot schools and Chapters. There’s lots to talk about, lots to investigate, and we can re-energise public engagement with it. We can also get cracking on a long-planned early sales campaign. With the new website we also plan to renew our branding. This will place more emphasis on LM1’s unique archive and funding model. The science teams have been transformed into an international network of over 50 scientists, ready and willing to engage in their specialist areas. Academic work has concentrated on confirming the overall mission profile and identifying the key technology risks. This has resulted in the identification of LM1’s most important engineering challenge: the research, design and build of a means of incrementally creating, in situ during the drilling cycle, a borehole casing by additive manufacturing. And this technology is pretty exciting, ground-breaking (pun intended) stuff! Two major independent project studies by the International Space University in France and Cranfield University in the UK have reviewed and checked LM1’s mission concept. The Technical University of Berlin is joining us to help with the casing challenge. We have also changed our strategy for procuring the main mission contract and are going straight to a single industrial consortium negotiation. Following informal talks with two well-known aerospace leaders, we expect to start formal negotiations with preliminary commitments during the course of 2017. As many participants in New Space know well, getting a novel project like LM1 underway without official space agency support is difficult. Yet space exploration globally is gradually moving towards a general consensus that the Moon and its orbital vicinity will become within the century a strategic staging post for planetary exploration, and that requires a permanently manned base. There is also increasing awareness that to make sensible progress in this most expensive of endeavours, space agencies must internationalise their programmes, exploit private sector resources and engage their citizens. Lunar Mission One hits the sweet spot, so things are looking good for the long term. We wish you all a Happy New Year and hope that in the near future you’ll find us communicating a lot more news! Thank you for your continued support and we hope 2017 is a great year for you too. PS Please contact us if you want to introduce a new pilot school, or start a new Chapter, or otherwise volunteer. C = Chapter. S = one or more schools.